Nice review! The Delica is a personal favorite of mine and has been for years. Thank you Matt! This is an absolute classic. An Australian friend was looking one these for a first good pocket knife for her daughter, and she thought one of these would be great. Sadly, they have a lot of trouble importing these down there and the chances are good that it would be confiscated at customs as a gravity/flick knife. Madness! A real pity, as even though I choose not to own Spydercos for personal reasons, I fully admit they’re excellent knives and worthy of anyone’s EDC lineup. That really is a shame RK – Australians should have access to these awesome knives. Sometimes I take living in America for granted. It’s ok I find the allure of the Spyderhole hard to resist and as a result I own way too many Spydercos – plenty for both of us. 🙂 Thanks for droppin by. I’ve heard some importers will tighten the pivot up quite tight to get them through. I’ve had excellent service buying Spyderco knives in Australia from Ron who runs urbanconquest. He’ll easily get you a delica for a reasonable price in Australia. Thanks for clearing that up a bit for us R. I’m glad to hear it’s not impossible to get one as it really is an awesome EDC knife. Thanks for stopping by. Easily my favorite medium-to-small EDC knife. The traditional saber ground Delica 4s are still available, but I think this full flat ground version is the way to go. Huge slicing power for the size and weight. I wish I owned all five colors. Yes, this is just an absolute classic. Great balance, materials and fit/finish. The new orange version is really striking. Wish I had held out for one of them! the delica 4 is my favorite knife i own as of late but i paid $66 for mine. I wish I would have shopped around more but that is the brakes. I am proud of this knife and it is japanenese right. I hope. it says SEKI-CITY japan. I just want to stay away from chinese made products. This is my new edc. Hey Matt, Sure you probably could have saved $15 or so, but it’s small potatoes when you consider the value of a good knife. And it definitely is made in Japan. Enjoy it my friend! Thank you very much Hieu! You are really too kind. I recently bought a Manix2 Lightweight and its a great knife but somehow my Delica4 keeps finding its way back into my pocket. For EDC it just simply cannot be beat in my humble opinion. I actually own three of them:) Two FFG, Tan and Orange and one sabre grind. The sabre feels stronger but the FFG just cuts so effortlessly. Spydie Fan for life here! Very nice, Russ! The Delica is a classic, no denying it. Carry them in good health! After studying your blog for a few days, I finally bought my first EDC folding knife, the Delica 4! The copy I received feels fantastic. But I’m slightly concerned that it might not be the genuine one as it did not come with the paperwork somehow. I’ve done a bit of searching to see if there’s detailed comparison of fake vs real delica 4, but couldn’t find anything useful so far. I used a video that compares real & fake endura as a reference, and so far my knife seems to be authentic. Except maybe one thing – my Delica 4 has very pronounced machine marks on the wider bit of metal underneath the cutting edge that’s connected to the grip. Same machine mark can be seen inside the round hole of the blade. I couldn’t find images of authentic delica 4 online to verify if this is normal, I was wondering if you could help? Congratulations! The Delica is a great folder for EDC. I hope you enjoy it. Honestly, I am not sure. My suggestion would be to take some good photographs of the knife and area in question, and post it in the Spyderco forums or the Spyderco section of BladeForums (or your knife forum of choice if you have one). The collective power of the forums will be far better than any opinion I could offer. Hope this points you in the right direction. I think the Wave Delica deserves a special mention. I have the Wave Endura 4, but sold my Delica Wave. I was in a phase of downsizing my expensive toys, and I decided to keep the Endura and flip the Delica. Now I’m deciding the Endura may be a little larger than is practical. Now I’m thinking of reacquiring a Delica Wave. I know Andrew at the Edge Observer is a big fan of the waved Delica. I wouldn’t mind one myself, and agree that a special mention is in order! Hi! Love reading your reviews…I got a Paramilitary 2 and a Caly 3 a couple years ago based on them! I’m currently testing out a Manix 2 for work use (turns out a black DLC paramilitary is not a very “high visibility” color in the field), but find it to be a bit bulky. 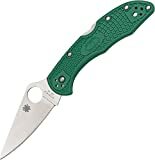 Would I be better off with a satin Paramilitary, or would a Delica be robust enough? The knife basically needs to cut rope and be capable of some light whittling. Danny, Thanks! So glad to hear you have been enjoying the reviews. I think the Delica would be robust enough for what you are describing. It’s not as strong as the Para 2, but should get the job done and is a much slimmer and lighter knife. I say try it out. Thanks! I just may…although I may just keep the Manix for now as, size and weight aside I fricken love the ergonomics!